This afternoon I had a surprise conducting turn to Canonteign Estate, Devon. Fortunately I didn’t have to drive all the way up to Somerset first, I’d arranged to meet my driver at Exeter Services. In fact we arrived at almost the same moment! As I drew up to the lights beside the motorway, so did 2 double deck buses from Quantock Motor Services. 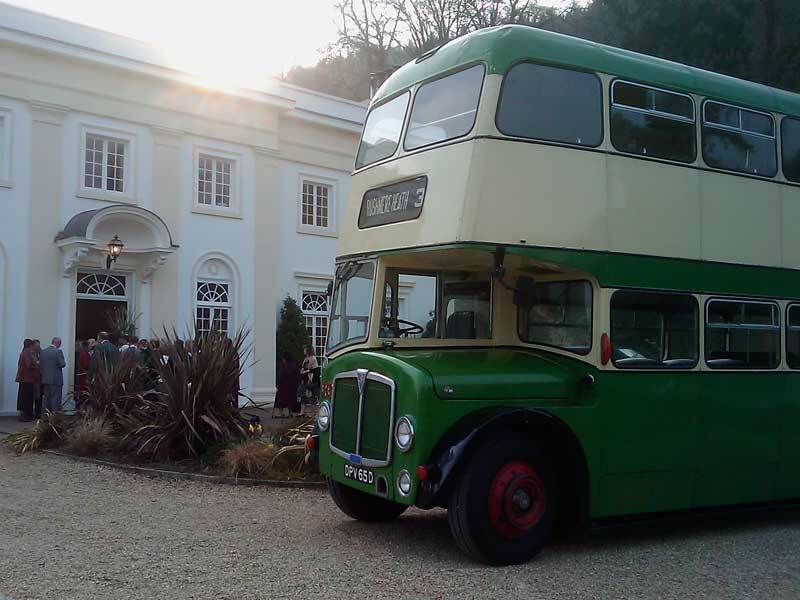 The job was to pick up a large wedding party (hence the two vehicles) from St David’s Church, Exeter and take them to Canonteign Estate, a splendid Georgian mansion deep in the stunningly beautiful Teign Valley near Chudleigh. My driver was also the boss and we had an ex-Ipswich Corporation AEC Regent V. The other bus was an ex-Stockport Corporation Leyland PD3. Strangely enough they both had the same bodywork – by Neepsend (East Lancs) so, apart from the liveries and engines, they looked quite similar. We drove in convoy through the centre of Exeter, drawing glances from the Saturday shoppers, in plenty of time to meet the wedding party. Almost as soon as we arrived the church bells began to ring. Were they for us or the happy couple?! Two ushers hurried out of the church, both bearing large metal vases containing spectacular flower arrangements. Worryingly, they headed towards the buses. Apparently the flowers needed to accompany the guests to the reception venue but the only place on the bus they could travel was on the platform! The other conductor and I both agreed to prop up the flowers on the journey, lest they topple over. Which was a pity because I was then unable to issue any souvenir tickets after we set off! At last I’ve got a confirmed place on a PCV practical driving course. I’m going to Plymouth in about a month for a 5-day practical course with a test on the Friday. I’d better get my books out again as it’s been nearly a year since I took the theory tests and I’ll need to be on top form to pass the CPC Practical Demonstration module. It looks like I will get some conducting turns on the Exmoor route this summer after all. 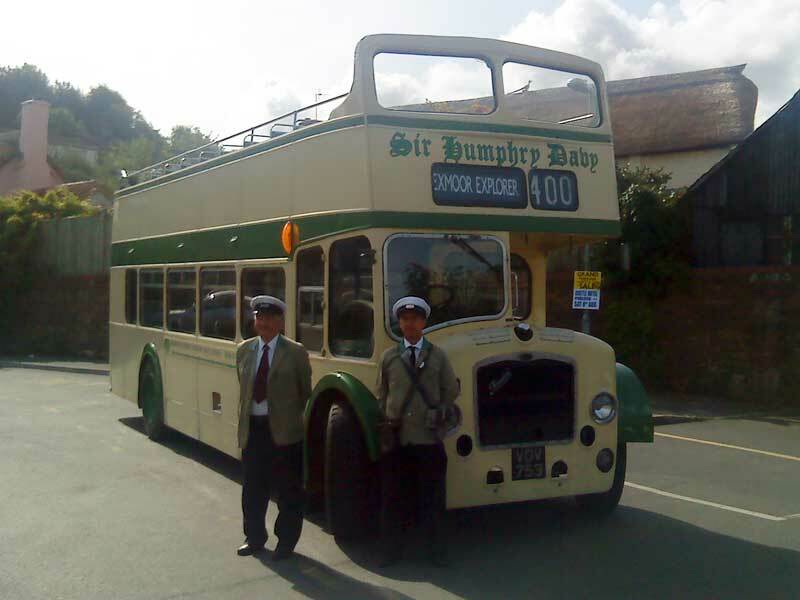 Although Somerset County Council has withdrawn its financial support from the service 400 “Exmoor Explorer”, the operator of the route has agreed to run the service as a commercial route, i.e. without any subsidy from the Council (see the Bus Service Changes page on the Council website). Quantock Motor Services will run the 400 on Tuesdays, Thursdays, Saturdays and Sundays from July 23rd until September 4th and also on the remaining Sundays of September. I’m not sure that timetable and fare details have been confirmed yet but they will probably be similar to last year. Bus passes are unlikely to be accepted though. 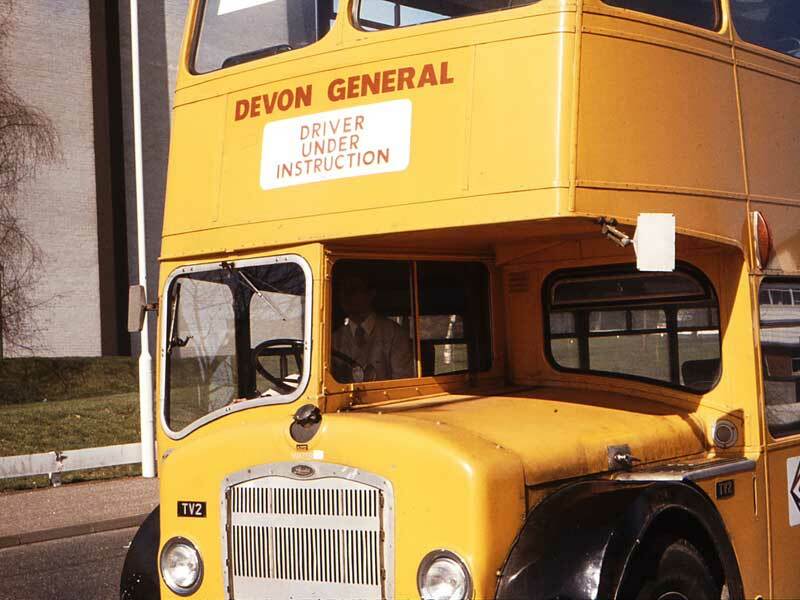 Just to recap, this post continues my account of some free driving lessons I managed to wangle out of Devon General in 1985. The purpose of driving down to a quiet part of the Marsh Barton trading estate of course was so that my first attempts at driving would not pose too much of a hazard to other drivers. 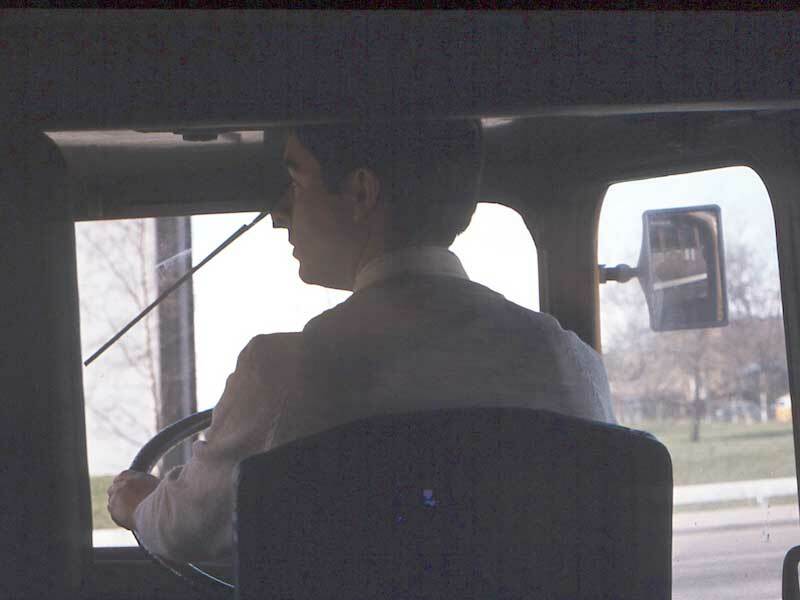 Bill Porter, DG’s Senior Instructor, climbed down into the saloon through the space behind the driver’s cab that was once a window. “There you are, it’s all yours!” he said cheerily. Once in the driving seat I immediately felt two emotions. First, elation at finally being allowed behind the wheel of one of my favourite buses. Second, a feeling of dread at what I was about to attempt. The second one was soon to eclipse the first as I pulled gingerly away from the kerb. I was struck by the enormous width of the vehicle compared to the cars I had been used to driving. Then there was the heavy steering. I began to regret not doing some bicep exercises previously! As the first morning’s lesson wore on, I began to appreciate Bill’s advice “…everything happens slowly in a Lodekka”. I was quietly confident that I would be able to master the double declutch technique needed for the crash gearbox, having spent hours and hours in my childhood kneeling on the bench seat at the front of Wilts & Dorset Lodekkas in Salisbury. I was fascinated by the drivers’ skills, some greater than others it has to be said, with the unforgiving gearbox. By the end of my first lesson I was indeed fairly proficient and my gearchanges were getting quieter. Hardest of course, was changing down. I struggled to rev the heavy Gardner 6LW engine enough to allow the gears to mesh neatly, but I was improving all the time.